I confess, I did finally give in to temptation and distraction, and set the undead aside for a moment. But it was for a good cause, a quick little project for my wife's birthday. 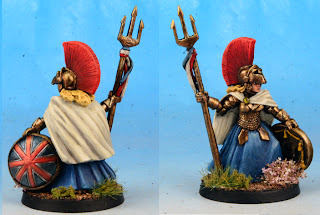 When I was painting the sample figures for Rogue Miniatures last year, and looking at the rest of their catalog, she was looking over my shoulder and commented on the Britannia fig. Not surprising that a nice sculpt of a powerful female archetype resonated with her. I tucked that away and months later procured a copy, which I spent some time on recently, and now it can sit on her desk and protect her laptop, or otherwise hangout with some of the other desk guardians she has.
. . . Rule Britannia! Britons never shall be slaves . . .
My proof of concept proved the concept enough for me to proceed on this project. I'm pretty pleased with the results so far. I so nearly fell off the wagon yesterday. My next (and last??) undead unit to finish off in this project is a spirit host. I've had an empire gun crew primed and sitting on my desk for about 8weeks. October's painting contest over at the Empire forum is Artillery, and I haven't entered anything over there in months. It all was lining up for a perfect storm of doubt and distraction, and I even pulled out the bases I was preparing for these artillery projects and test fit them, and then I cleaned the integral bases off one of the gun crews. I was that close to setting the ghosts aside to knock out a quick artillery base. I had painting mojo, the day off, and just enough reasons to derail and do something else for a week or two. But, in uncharacteristic form for me, I managed to stick with it, and decide to focus my mojo on solving the ethereal issues before me. One way or another I need to figure it out, and if figuring it out meant abandoning this unit, then I was already done with the army! So, yeah, might as well figure that out. I did 3 figures last night in my first test to see if I could do a convincing rendition of what I had in my head for how ghosts might look. I think its headed somewhere I'll be happy with. Hopefully I'll get the first element put together in the next day or two, and that'll convince me to persevere or abandon the project. Further updates should be along soon.
. . . she's crazy about ballerinas.